Cozy Chicks: Now that feels a lot better! Now that feels a lot better! Happy sigh. Now that looks and feels a lot better! What does? Well, my bookcase does. Our house is full of bookcases, some orderly, some chaotic, but the one that matters (aside from the cookbook and gardening collections) is the one in my office. This is where my reference books are, where the signed mysteries written by my friends reside, where the record of my own work sits. It’s full of books that mean something to me, books that are useful, and books that I plan to reread someday. The trouble was that when we moved for medical reasons two years ago, someone else packed my books, as I was at the hospital helping my husband. Then when my office shelves went up, someone unpacked them for me. I will not name names. But the problem was that titles were not where a person might expect to find them. As a lapsed librarian, this bothered me. As a former bookseller, it bothered me even more. As an author in a hurry, it drove me nuts. Oh sure, I know the internet is full of information, but I still like to get mine from books. I became frustrated when I was writing a comic mystery play this summer and couldn’t find my very few, but extremely useful, books on writing plays. More than missing out on the right book with the right info, I felt that some books were like old friends. I just wanted to visit them from time to time. But where were they? Not where they belonged, for sure. So this week with the launch out of the way, the synopsis for the next book delivered, the deadline for the book itself still comfortably in the future, I was able to find the time to put things in order. I don’t mean cataloged or even in alphabetical order. Nor do I mean organized by height or color. All I want is for my books to be sitting on a shelf with other books on the same or similar topics. In my office, every book has a reason to be there. I remember when I bought some of them, back when I was starting to write. Others were gifts or books that changed my life in some way. The Agatha Christie reference books, the Dorothy L. Sayers novels and the collection of Rex Stout’s Nero Wolfe mysteries are earning their keep in the book collector series. Others are books on organizing from the days of my Charlotte Adams organizing mysteries. There are guides, maps and Italian phrase books from the trip to Italy to research The Dead Don’t Get Out Much, my fifth Camilla MacPhee mystery. A few titles deal with ADD, but don’t let me get distracted. If you are writing mysteries, you need to find out about the strangest things, for instance: How to Cheat at Everything, a goldmine for the book collector mysteries as is Caring For Books and Documents, a British Museum publication. There are three baby name books, all well-thumbed. I love them because they give the meanings of each name and also the most popular names for boys and for girls for each decade, in the USA, in the UK and in Canada. It’s so important not to have an eighty year old Candee! One of the wonderful things that came out of the reorganizing was locating books that I’d been looking for or missing. 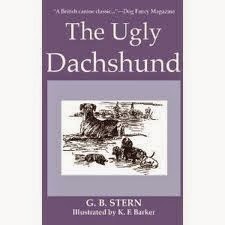 I was thrilled to find The Ugly Dachshund, a gift from a friend who knew I loved wiener dogs. It’s one of my favorite books of all time. I keep buying copies to give away. Then I turned up Anne of Green Gables, a gift when I finished fourth grade. 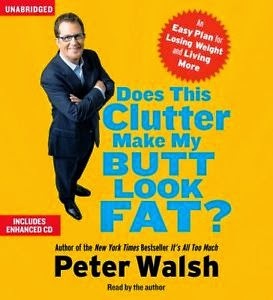 The book I find most irresistible? 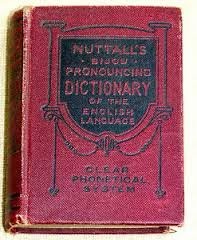 Nuttall’s Bijou Pronouncing Dictionary of the English Language, not quite four inches high, a treasure from my husband. There I am, rambling on about the books I am so fond of. Consider that you’ve had a close call that I don’t mention them all, because I could go on. But enough about me and my shelves, what’s on your bookshelf that brings you laughter and tears or brings back memories? Are you organized or serendipitous? I know I’m going to love your answers! I get most of my hard-cover mysteries through the library but buy tons of paperbacks which I like to keep. I had three bookshelves specifically built for paperbacks ( 4 shelves 7 inches deep by 7 1/2 inches high). I organize alphabetically by author and then by place in the series. If an author has more than one series, I put the first series first, etc. Okay, I want to come to your house and read all those books. Before I actually retired we considered a lot of options: move out of state, move within the state, spend a year or two in an RV. . . so while I didn't stop buying books I wasn't as diligent about organizing them as usual. Circumstances eventually determined that we would stay right where we are. Whew. No books had to leave. The RV idea really had me concerned because I could probably stock a bookmobile. So now I am trying to put them back in order, or at least insert the additions, which means shifting everything. I organize them by category and then for fiction by author and then by series. Some little decorative thing related to the subject might be nestled in occasionally but bookshelves are primarily for books! MJ, you have inspired me to do something about my wildly cluttered book shelves. They're a mess. I donated boxes and boxes of paperbacks to a book sale and still am overwhelmed. It's so hard to part with a book and now that I've winnowed down the mountain of books, you would think the clutter would have gone. Bu somehow "new" books have sprouted in their place. (kind of like coat hangars in a closet overnight.). But you've given me the courage to tackle it! Great blog. I really have to get a handle on this and make a trip to my local new & used bookstore. Well done, Mary Jane. It is important, to have those books where you can find them. Twenty-nine years ago I found the house we live in now, and was drawn to it largely because of all the built-in bookshelves in five different rooms. Which are overflowing, and added to by many additional bookcases. Like Mary Kennedy, I donated 1,000 books to the library book sale a few years ago, but you can't tell I took a single book out of the house. And that was before I bought my first (of three) Nook, and had a Kindle account. I'm like you, I like my bookshelves organized. Which is why I packed and unpacked them myself when moving two years ago. It's easier to find what you're looking for when they are shelved by genre and author. It's one of the things that bugs me most in browsing the used book store's clearance section -- it's all a jumbled mess and impossible to search out the authors or genres you like best. I am impressed! I too love to have series and have them organized by author and then chrono. Didn't get that far this time though. Sounds lovely and I really enjoyed the idea of squeezing a bookmobile's worth of books into your RV. In reality it wouldn't have been nearly as amusing. Thanks for coming by - come to my house whenever you want! I love the books and coat hangers comparison - what is it with those frisky critters? New books materialize daily here - where do they come from? I love this! My husband (who has 5 - 6000 books!) has moved to an e-reader. However, he has not stopped buying books. What can I say? I feel your pain. I can see you on your book visit, Diane! Glad you are keeping in touch. On the other hand, so frustrating when there's no order to books at all. Karen, like me, you have readeritis! We just love our books. I am convinced that if one leaves the house, three more sidle in the back door. Glad we're not alone and can commiserate. I totally agree, Heather. It saves a lot of time and aggravation in the long run to just do it right the first time. It is a pleasure to back up book and even when they are organized, there are some that are a pleasant surprise to meet again. They might very well be reproducing somehow. But I've read nearly every book here, so that can't be true. I don't think. I have my house up for sale, I have for the first time in my life wonderful bookshelves. I must leave behind. I did not know my older brother was going to sell his house and move away from where my parents lived. Now I must leave my bookshelves behinds and move near them. The difference in house prices means it will probably be a long time before I have such marvelous shelves again. I love your dictionary. I collect dictionaries when I find the right ones. I just love them. I have a small bookshelf near my desk with reference books on it, and a bookshelf in my craftroom where all my craft books live. Sigh soon most of them will be assigned to boxes again. And back to scratching my head to wear what book is where. I try to pack my own books, but am not sure what is going to happen this time as I am traveling between where I live and my parents as my mother has a broken leg and must put no weight on it for the next twelve weeks. My dad is at a loss as to what to do at home by himself and my mom is homesick being in an assisted living facility - there house just does not have the room for her to get around in a wheel chair. Oh boy, Liz! What a tough time for you. I hope there are new bookcases in your near future. Also hope your mum recovers soon. I used to have overflowing book shelves that I did my best to keep organized by type or author. But because my eyesight is failing, I've had to switch to Kindle books - where I can increase the font size and read either on the Kindle or on my large computer monitor. Plus, over the last year or so, I have been trying to get as many audio books as possible so that, when I reach a point where increasing the font size isn't enough, I can still listen to my books. I donated most of my books to several animal shelter book sales, but there are still quite a few books that I just cannot get rid of - even though it would be difficult for me to read them. I'm hoping that one day some of my friends or family will want to give them a good home. Unfortunately, right now they are just tossed on shelves - which is frustrating. But one of the projects on my "to do" list (which is as thick as a book) is to clean and reorganize my office and organize the books. Glad you were able to get your books reorganized. It is really frustrating when you need something and can't find it. Lynda, Is there a Friends of the Library group anywhere near you. I am sure they would gladly take your books and sell them to make money for the local library in your area. Good luck!